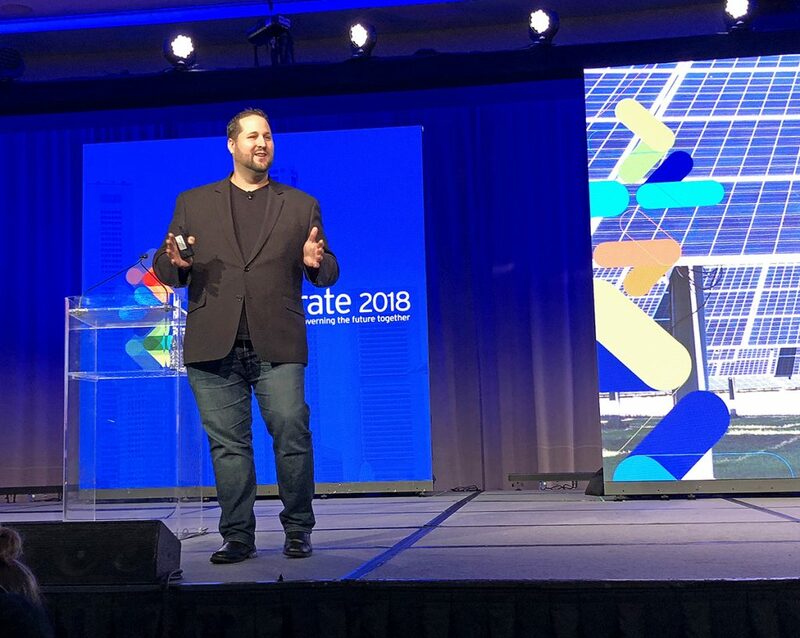 Dustin Haisler, e.Republic's Chief Innovation Officer, reveals key findings in emerging regulation research at Accelarate 2018. In the face of a rapidly-changing regulatory landscape, government leaders will need to team up with technology providers in order to increase communication and cooperation across a range of operational areas, new research shows. These are among the findings that were unveiled at the Accelarate 2018 conference, on Oct. 12, in Atlanta, Georgia. The findings were presented by Dustin Haisler, e.Republic’s chief innovation officer and are part of a new study conducted by e.Republic’s Center for Digital Government, and underwritten by Accela. For the study, researchers surveyed more than 125 state and local government professionals about the impact of new and emerging regulations. Civic leaders say that in order to cope with an expanding range of regulation – covering everything from cannabis to rideshare — they will need technology tools that foster collaboration and improve service delivery. New regulations will likely have a sweeping impact across a broad swath of government functions. Nearly half of respondents said they expect inspections, oversight and permitting to be affected. But the impact of regulations will go further: Compliance and licensing, business development and citizen satisfaction will all be affected by regulatory changes, respondents said. Many of the perceived challenges surrounding regulation lie squarely in the domain of enhanced communication and cooperation. Government entities impacted by evolving rules need to be ready and able to share information effectively with internal audiences, with other agencies, and with outside partners. A failure to communicate could have serious consequences. Thirty-eight percent of those surveyed said that a lack of informed best practices will be a hurdle to those implementing new regulations. At the same time, government leaders expressed a strong sense that more needs to be done to enhance communication on the citizen side as well. Forty-three percent cited a lack of community awareness around regulatory changes as a pressing problem. While communication and coordination rank high as emerging concerns, those in government tasked with implementing new regulations also see a wave of unmet needs around technology. One-third of respondents say regulatory pressures will drive a need for expanded data collection tools, and a third say regulation will spark a need for better mobile technology platforms. The rapid pace of regulatory change also seems to be impacting the IT imperative. Thirteen percent of respondents say they will need agile development tools and 12 percent said they will be seeking rapid-deployment solutions as a result of regulatory pressures. Drilling down deeper, the survey looked at the specific technologies that will be needed to support the regulatory enterprise at the state and local levels. Top vote-getters included system integration (34 percent), user-friendly, centralized platforms (28 percent) and mobile solutions (28 percent). Government leaders look to SaaS to meet many of these needs. About a third of respondents said SaaS solutions would improve their capital budget situation; another third look to SaaS for its mobile and cloud-based utility; and a third think SaaS will enhance their security posture. What will be regulated? Government leaders identified some usual suspects: drugs and alcohol, firearms, cannabis and e-cigarettes. Beyond these, though, government leaders also see an emerging class of regulation around a range of new services including short-term rentals (think Airbnb); ride share services (like Uber); and transportation (a la Zipcar). Anywhere from 17 to 28 percent of respondents said they expect to see these various services come under expanded regulatory control within the next two years. Technology also may be increasingly regulated. Fourteen percent expect unmanned drones to spark new regulation. Others foresee regulation around home assistants like Alexa, while others think 3D printers may fall under a regulatory umbrella. With all this emerging activity around regulation, respondents voiced a shared need for technology solutions such as SaaS: Platforms that could be implemented quickly and cost-effectively, and that enhance the sharing of vital information and processes. “SaaS could be most useful in getting city governments to utilize APIs and other public sharing of appropriate information,” as one responded stated. 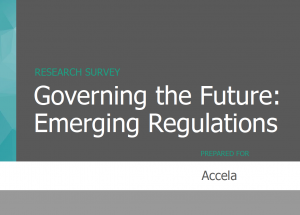 For more details on Accela’s Civic Solutions for Emerging Regulations click here.